Halo has been one of Microsoft’s big games on its Xbox 360, and it has just been announced at the San Diego Comic-Con that Halo 4 will have a release date of 6 November, 2012. Not only that, but released on the same day, and available for pre-order now, will be a Limited Edition Halo 4 version of the Xbox 360. In the box is a Halo 4 Xbox 360 console, with a 320GB hard drive, and a design and colour scheme, including the ring of light on the console being Halo 4 blue rather than the usual red. In addition, the limited addition also includes two Halo 4 inspired controllers, a standard edition copy of Halo 4, a wired headset, and Xbox LIVE tokens for exclusive Halo 4 in-game and avatar marketplace downloadable content. If that’s a little much, Microsoft will also be selling the limited edition Halo 4 controller with the United Nations Space Command (UNSC) emblem, plus an Avatar T-shirt as exclusive downloadable content. 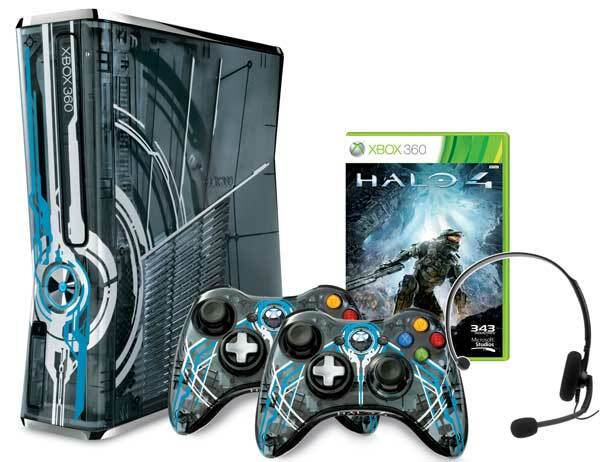 Click the thumbnails below to see an image gallery of the Halo 4 Xbox 360 console and accessories.